There's no need to plan a party at which to serve this BBQ-Bacon Party Spread. Make it now and trust us—a party will start. Spread Neufchatel onto large platter or bottom of 12-inch pizza pan; drizzle with barbecue sauce. Top with bacon, vegetables and cheddar. Prepare recipe as directed. Sprinkle with chopped fresh cilantro. Serve with scoop-shaped corn chips or tortilla chips instead of the crackers. Prepare as directed, substituting chili sauce or TACO BELL® Thick & Chunky Salsa for the barbecue sauce and/or add a layer of finely chopped lettuce, celery or OSCAR MAYER Bologna for the spread. 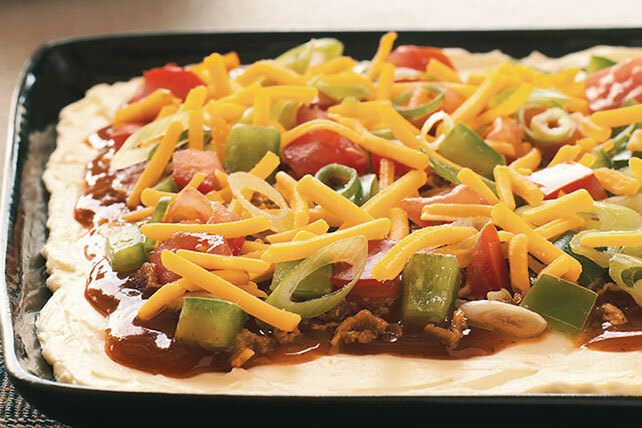 Prepare using your favorite flavors of KRAFT Barbecue Sauce and KRAFT Shredded Cheese.